Well, hello there! It’s been a while, almost 3 months actually, since I’ve shared a Personal Style post. It’s also been a while since I’ve wanted to share a Personal Style post. Let’s just say I wasn’t feeling the whole process of getting dressed, taking pictures and blogging about my outfit while. For the past few months I’ve been living in leggings, sweaters and sneakers while hibernating in our one bedroom apartment, my office and my parents house. But please, don’t feel sorry for me…at all. I thoroughly enjoyed the last few months! During my “hibernation” I made time to plan and prepare content, among other things, for the months ahead. I also spent much needed quality time with my husband, family and good friends. Catching matinee’s and finishing some really good books is also something I enjoyed during that time. 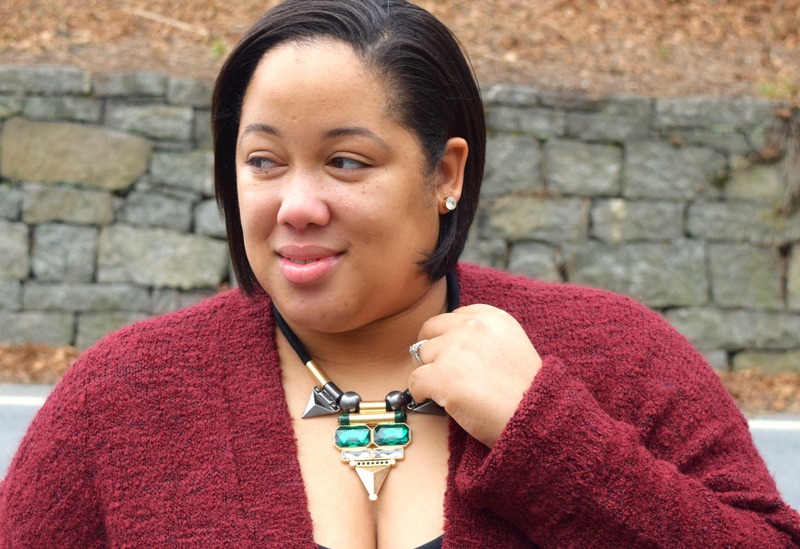 But alas, it’s time to resume sharing those minimal #WNJStyle posts and re-enter my world of Whitney Nic James, the blog. 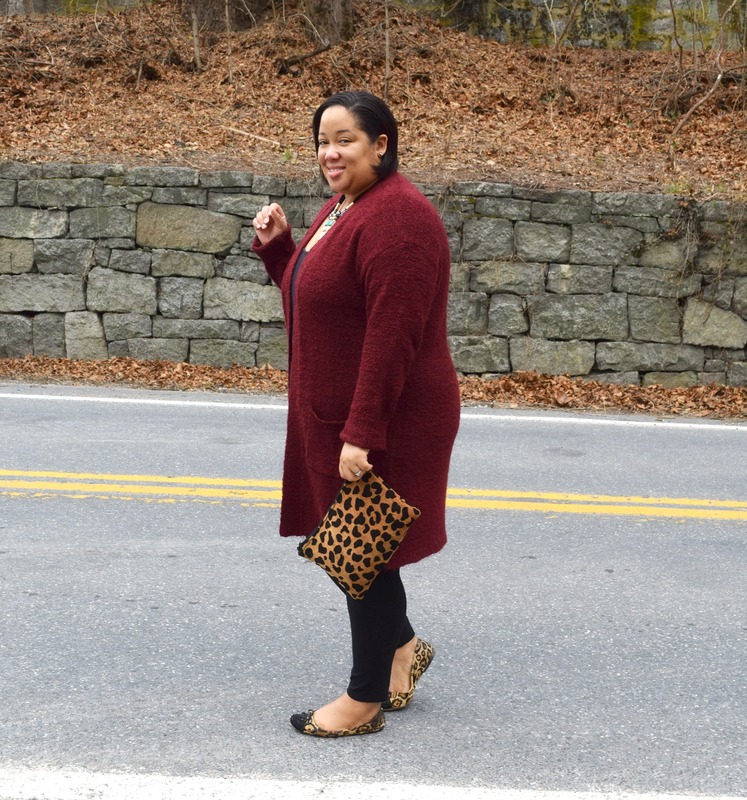 When I think about my wardrobe last season, as well as the current one, I notice that I’ve worn a lot of burgundy and black and burgundy and leopard print. It seems to be my go-to color combo. Deciding to wear these colors together is a chic style choice; the warm tone of burgundy is perfect for the fall and winter season(s). Adding leopard print to the mix brings it all together, don’t you agree? 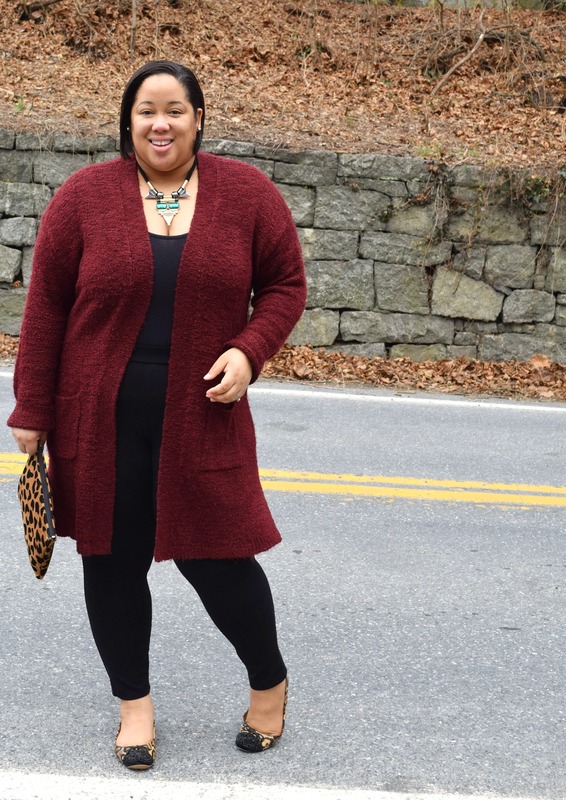 This burgundy cardigan is one of the few pieces I’ve added to my minimal wardrobe this season. I’m still being very selective about the wardrobe items I add to my closet, but this piece was a must. It’s versatile, the color is timeless and the material incredibly warm. There have been quite a few days that I’ve worn this cardigan as a light jacket/coat, with a scarf of course. And did I mention it was on sale when I purchased it? The sales racks at Target (still) get me, everytime. So tell me, how have the past few months been for you? 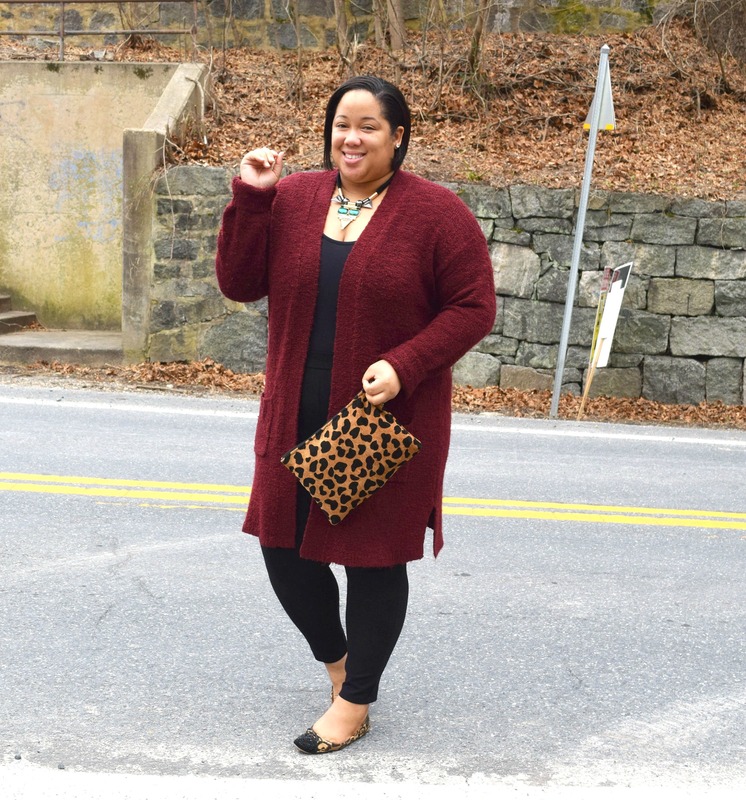 Have you been wearing a lot of burgundy and black like me? Let me know! Thanks for stopping by and thanks for still visiting WNJ, and keeping up with me on social media, during my blog break. I’m excited to be back and even more excited to catch up with you all. Until next time, be blessed and stay safe…XO! Welcome back! While, as bloggers, we try our best not to have an extended break. But, hey, when it’s needed…it’s needed. Meanwhile, hand me over that cardigan right this instant. Welcome back! I love your burgundy and black! Ohhhh… how I know ALL about a hiatus so well needed at time ~You’re necklace is the cutest! ~Loving the entire look and I’ve been wanting some Leopard flats for a while now. Welcome back & look forward to seeing your posts. YESS! Sometimes a break is just what you need to get focused and re-centered. I know you know all about that. 😉 Thanks for the welcome back…XO! Welcome by and share this post and your latest Style Posts with my linkup. A brand-new one is live every Thursday. Share your gorgeous style with my readers. Thanks so much and enjoy the weekend! By the way, we missed you in blog-land Whitney so I was so glad to see a post from you today and especially with how stylish you look. A hug welcome for you! Ada recently posted…Thursday Moda #49: Florals into Early Spring. Thanks, Ada! Will head over this week. I love the fact that you’re not always in high heels. I very rarely wear heels so it’s wonderful to see someone who shows me how to pair clothes with flats. Thanks for that, Jewel! Heels are cool, but flats and sneakers are so much more practical for me. Sometimes taking a little blog break can be just what you need! 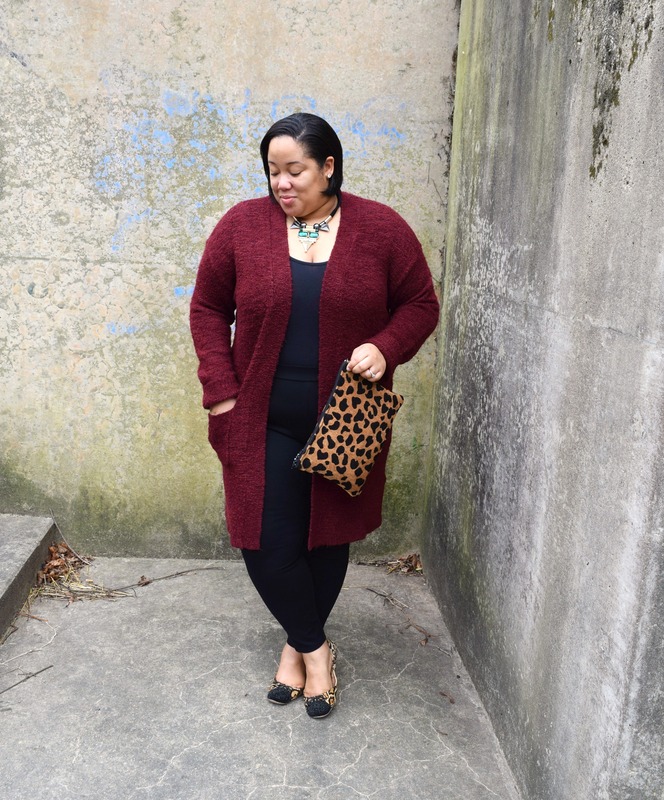 Love the burgundy cardigan, and that fab leopard clutch! Very true. Thanks for stopping by and for the kind words. XO! Loving this long sweater on you! A break is definitely needed from time to time. Love the colors and that necklace is beautiful. Thanks, Roni! It sure is, but I’m glad to be back. Aww, thanks! I can’t wait to enjoy the concert this weekend. Thanks for linking up to the Ageless Style Linkup! No problem! Thank you for hosting.